A simple wipe sampling procedure was developed for the surface contamination determination of ten cytotoxic drugs: cytarabine, gemcitabine, methotrexate, etoposide phosphate, cyclophosphamide, ifosfamide, irinotecan, doxorubicin, epirubicin and vincristine. Wiping was performed using Whatman filter paper on different surfaces such as stainless steel, polypropylene, polystyrol, glass, latex gloves, computer mouse and coated paperboard. Wiping and desorption procedures were investigated: The same solution containing 20% acetonitrile and 0.1% formic acid in water gave the best results. After ultrasonic desorption and then centrifugation, samples were analysed by a validated liquid chromatography coupled to tandem mass spectrometry (LC–MS/MS) in selected reaction monitoring mode. The whole analytical strategy from wipe sampling to LC–MS/MS analysis was evaluated to determine quantitative performance. The lowest limit of quantification of 10 ng per wiping sample (i.e. 0.1 ng cm−2) was determined for the ten investigated cytotoxic drugs. Relative standard deviation for intermediate precision was always inferior to 20%. As recovery was dependent on the tested surface for each drug, a correction factor was determined and applied for real samples. The method was then successfully applied at the cytotoxic production unit of the Geneva University Hospitals pharmacy. 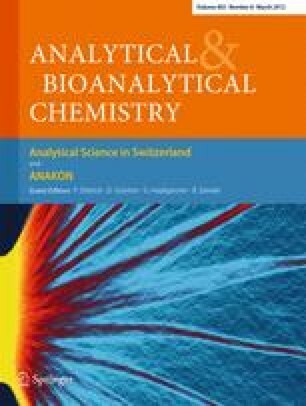 Published in the special issue Analytical Sciences in Switzerland with guest editors P. Dittrich, D. Günther, G. Hopfgartner, and R. Zenobi. The authors kindly thank the Proteomics Core Facility at the Faculty of Medicine, University of Geneva (Switzerland) for the loan of the LC-MS/MS instrument and the Unit of Toxicology, University Center of Legal Medicine, Geneva (Switzerland) for the wiping papers.